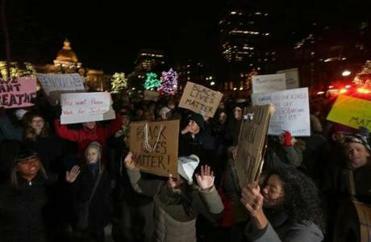 Thousands of protesters gathered at the tree-lighting ceremony at Boston Common on Thursday before fanning out across the city, assembling amid the festivities to register their outrage over a New York grand jury’s decision not to indict a white police officer in the choking death of an unarmed black man. Protesters blocked traffic in several locations across the city and disrupted MBTA service, but the demonstrations remained largely peaceful. At least 10 protesters were arrested by State Police and Boston police, spokesmen said. The demonstration came a week after 1,400 protested in Boston following a similarly controversial grand jury decision in Missouri, where a white police officer was not charged in the shooting death of an unarmed black teenager. Protests took shape Thursday afternoon, and grew as the city’s holiday kick-off event continued at Boston Common — an unusual juxtaposition with the normally cheery annual celebration. Thousands protested the chokehold death of Eric Garner at Boston’s annual tree lighting ceremony. The protesters were largely ignored by the spectators, as well as by Canadian dignitaries who were escorts for the huge tree that graces the Common every year. Addressing the crowd during the tree-lighting ceremony, the mayor of Halifax, Mike Savage, shouted over protesters chanting “Hands up! Don’t shoot,” which has become an anthem in the wake of the unrest in Ferguson, Mo., that followed the shooting death of 18-year-old Michel Brown. By the time the tree’s lights went on shortly before 8 p.m., hundreds of protesters were marching toward the State House, where three were arrested as a crowd surged into a State Police line. Boston Mayor Martin J. Walsh made no mention of the protest just up the hill. “Thank you to everyone who came out to celebrate tonight,” said Walsh, as the crowd roared with delight. During the course of the next few hours, overlapping chants cascaded through streets from Beacon Hill to the Bulfinch Triangle, along the North End’s edge and into Charlestown and Cambridge. Marchers periodically stopped to sit or lie down in the street — “die-ins,” mimicking deaths like Garner’s — then rose with their hands in the air. Some groups diverged from the main march only to rejoin a few blocks later. One group, thousands strong, attempted to get on Interstate 93 near the Leonard P. Zakim Bunker Hill Memorial Bridge but was thwarted by police. Protesters paused near Leverett Circle, staged a die-in near the Zakim Bridge, and marched into Charlestown and Cambridge, closing off traffic at several points. Wherever they went, police in bright yellow jackets lined the route. Confrontations between protesters and police were few, as some marchers held their signs up to officers’ faces, and another group carried mirrors — “for the cops, so they can see what they look like on the wrong side,” said Becca Chapman. None of the officers said anything to her, Chapman said; they mostly adjusted their hats. As the protests gained steam Thursday, Boston Police Superintendent in Chief William Gross said officers planned to handle the latest round of unrest with the same “soft approach” with which police engaged demonstrators last week. Gross said he had spoken with some of the protesters, and understood their frustration with the failure to indict in the New York case on Wednesday. He said he supported their right to protest and was glad to see that so far it had been peaceful. Shortly after 9 p.m., more than 200 demonstrators rushed onto the highway off-ramp located near the intersection of Kneeland Street and Atlantic Avenue, stopping traffic on Interstate 90 for several minutes. Virtually all of the demonstrators voluntarily walked back off the ramp, and were followed down by State Police, who reported one arrest there for disorderly conduct. Colonel Timothy P. Alben, commander of the State Police, credited the protesters and troopers in a statement. Among the early demonstrators on the Common was Peggy Murphy, 63, of Brockton, who wore a pin with a picture of her grandson, D.J. Henry, a black college football player from Easton who was fatally shot by a white police officer in New York state in 2010. She noted that the officer who shot her grandson was named officer of the year by his union after the killing. A grand jury in New York declined to bring charges, but a federal inquiry is ongoing. “We pray every day that everyone might come to see the truth,” Murphy said. The New York and Ferguson cases — and a litany of cases from Henry’s back through decades before — have fueled a heated debate about policing in minority communities. Garner’s death in Staten Island in July was captured on video, and the decision not to indict Daniel Pantaleo, the officer seen administering the fatal chokehold, reignited demonstrations in several still-seething cities such as New York, Chicago, and Washington, D.C.
To many, the decision not to indict Pantaleo mirrored a St. Louis County grand jury’s decision — barely a week before — not to indict Darren Wilson, the officer who fatally shot Brown. Pina said that when he heard the news that the officer who choked Garner was not indicted, “I felt sick to my stomach. Martin Finucane of the Globe staff and Globe correspondent Kiera Blessing contributed to this report. Nestor Ramos can be reached at Nestor.Ramos@globe.com. Travis Andersen can be reached at travis.andersen@globe.com, Evan Allen can be reached at evan.allen@globe.com, and Jeremy C. Fox can be reached atjeremy.fox@globe.com.